Banknote counterfeiting techniques are becoming more sophisticated and widespread and effective counterfeit detection is more important than ever. Counterfeit detection needs vary widely, depending on the particular the advanced detection technology. 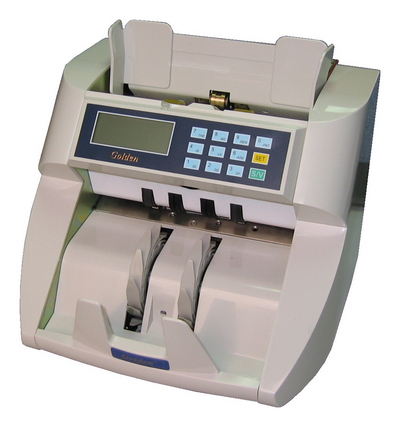 Golden-2000 banknote counters with the capability of value count for banknote, can put a mixture of notes on it and get the total amount. This machine will only give you the value of the bills counted. For instance if you have a stack of 10 ,EUR20 bills, the machine will tell you that you have EUR200.00. . This function suitable following banknote: European Euro, Malaysian Dollar, Thai Baht, Saudi Arabian Riyal, South African Rand, Singapore Dollar, Polish Zloty, Japanese Yen, Korean Won, UK Pound, Swiss Franc, Hong Kong Dollars, Danish Krona, Taiwan Dollars, Swedish Krona, Chinese Yuan.